How crowded will Star Wars 9 be? We're hearing it compared to a clown car or a phone booth in the late 50s. There are characters returning from the prequel trilogy, the original trilogy, the new trilogy, the animated series and perhaps even some of the in-canon novels that have been released over the last handful of years. Plus J.J. Abrams is adding 8 new peg warmers to the mix. Perhaps there's still room for one more character in there? 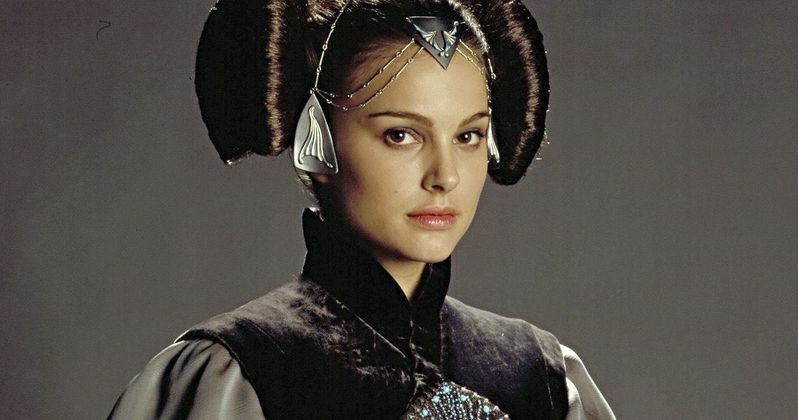 It sounds like Natalie Portman may be returning to reprise her role as Padme Amadala. Only this will be a cameo. And she'll have zero dialogue, unless you want to count the noises she makes when Anakin is choking her to death. It is possible that director J.J. Abrams could be utilizing footage already shot for Revenge of the Sith, but it also sounds like there will be a few new shots or angles that weren't utilized in that movie. It's easy to digitally de-age Natalie Portman, and she doesn't look all that much older than she did back in 2005, when the final prequel sequel came out. They could also just CGI the entire character without anyone really noticing. Just like Ghost was CGI through huge portions of Ant-Man and the Wasp, where everyone thought they were looking at a human actress. Yeah, the technology keeps getting better and better every year, and J.J. Abrams is going to be utilizing some state of the art VFX that are only now being perfected. It's long been known that J.J. Abrams plans on connected all of the past Star Wars movies in this final installment of the Skywalker saga. And that includes integrating prequel continuity. There is a ton of pressure on J.J. Abrams to get this perfect. It needs to resonate with old and new fans alike, and the hope is to bring back the sheep that have fled the flock following what many consider to be a disastrous installment with The Last Jedi. Star Wars 9 needs to feel like an authentic Star Wars movie. And he needs to do something special with all of the main characters. He also needs to make his 8 new characters useful in a satisfying way, as we'll probably never see them again. Things are a bit too crowded, which is where the idea of a Two-Part finale falls into play and continues to be a persistent rumor. In Star Wars 9, it is 'rumored' that Kylo Ren will be seen walking on a metallic bridge in a very dark environment. As though he were walking through space. He comes to a door with an oval shape, surrounded by blue lights. Through the doorway appears a vision from the past. He sees Padme's funeral on Naboo, as seen at the end of Revenge of the Sith. The camera pans across Kylo Ren's face, shock seeps into his cheek bones, he is surprised to see his Gradma for the first time. It's being described as the same kind of look a Star Wars Youtuber with toes for thumbs might get when sneaking to the fridge late at night to discover that all the Thanksgiving pie is gone. Utter disbelief. The shot cuts to Padme holding the Japor snippet necklace that Anakin made for her. It is clutched in her dead hands. Kylo Ren looks down and sees the same, or a similar necklace, locked in his own tight grip. There are blurry shots of Anakin choking Padme. Kylo witnesses the infancy of Darth Vader before the suit. It's not quite clear how Kylo Ren feels about this. It doesn't appear that Kylo inserts himself into the space time continuum of past Star Wars mythology to manipulate events that have already happened. It is unclear if the World Between Worlds is being used as a lesson for Kylo Ren, or if he is simply utilizing the device to learn more about his family history, delving into both the Skywalker and Solo bloodlines. Will Padme lead to Kylo's redemption? Or twist his heart further in the direction of the dark side? It was recently rumored that Erza Bridger will be fighting alongside Luke Skywalker on Maz Kanata's big pirate ship in the climatic end battle. Perhaps he has led the characters to The World Between Worlds. In a previous interview, John Boyega has described Star Wars 9 as the war to end all wars. And it sounds like we're ramping up to that conceit. This latest intel first showed up at Drunken Chicken TV.